We move through the chapter in three parts. First, we define organizing and answer the question of whether we in writing centers should do this work by showing how we already are. Second, we identify guiding principles consistent with the aims of antiracism as well as the collaborative and dialogic pedagogies of writing centers. Drawing on cross-disciplinary research, we articulate three frameworks for organizing: (1) direct action organizing (Bobo, Kendall, and Max 2001); (2) a balance of strategies and tactics (Alinsky 1945; Mathieu 2005); and (3) a dialectic approach (Papa, Singhal, and Papa 2006). We find the most potential in this third approach, one we see aligned with current research on both writing centers and community organizing and so we focus our discussion here. Third and finally, to put the principles into action, we analyze an extended case study of our efforts of organizing in professional associations and invite readers to participate in similar analyses on their own local organizing efforts. Here we add participatory action research (Fine and Torre 2006; Greenwood and Levin 2006; Sohng 1995; Weis and Fine 2004) as a method aligned with dialectic organizing to suggest a future direction for assessing our organizing efforts. Participatory action research (PAR), like dialectic organizing, promotes ongoing reflection, horizontal relationship-building, and democratic participation, thereby providing the means for antiracist work within one-with-one writing conferences and shared leadership of writing centers. Published version. 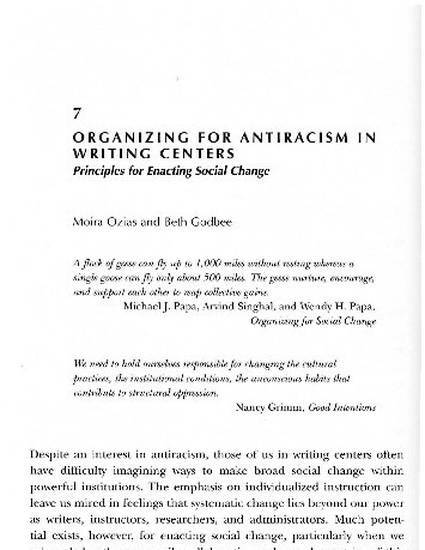 "Organazing for Antiracism in Writing Centers: Principles for Enacting Social Change," in Writing Centers and the New Racism: A Call for Sustainable Dialogue and Change. Eds. Laura Greenfield and Karen Rowan. Logan, Utah: Utah State University Press, 2011: 150-174. Publisher's Link. © 2011 Utah State University Press. Used with permission.